In Maine’s Penobscot Bay sits Nautilus Island, today’s dream home, a private 37 acre island that has remained under the protection of one family for more than 130 years. The property includes a six-bedroom main residence, with stone piazza and pool overlooking the bay. The island has its own vineyard, a two-bedroom farmhouse, and a guest cottage that is located at the edge of the island’s protected harbor with a pier and moorings. If you are going to be on your own island you might want your own bar– the boat house has been converted into a gathering spot with a kitchen, bar, and stone fireplace for family gatherings. The property also has perennial gardens, tennis court, a barn for storage, and lighted walking paths. The century-old cottage is a 3-bedroom home with an open kitchen/living room, a large bath, a dining room and a fireplace. It has splendid views of the sugar maples, vineyard, orchard, gardens and shore. Outside is a porch with a barbecue, dining area herb garden. 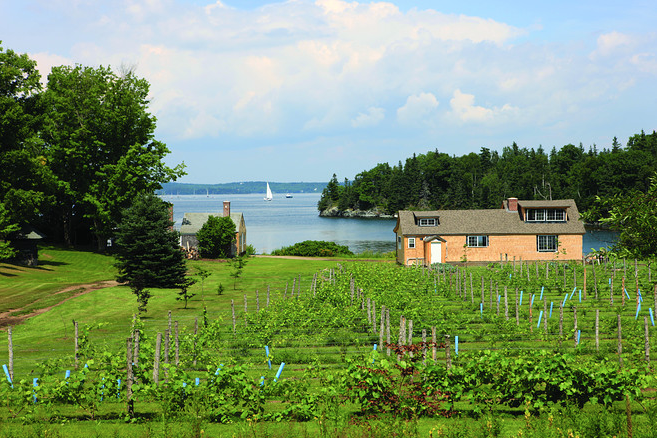 Looking across the bay at Islesboro and the Camden Hills, the property is rich in history and breathtaking scenery. Concealed by lush foliage and rolling green lawns, the property also includes a tennis court, lighted walking paths, a number of manicured perennial gardens and a barn for storage.